When I first started doing sound some 20 years ago, I used whatever connectors I could buy at Radio Shack. Then I discovered Switchcraft. Sure they're a bit more expensive, but wow--the 280 and 297 1/4" connectors are sooo much better than the cheap stuff. But when it came to XLRs, I never really liked the standard Switchcraft. Too many parts, those annoying small set screws, they just took too long to put together. They're tough, but assembly is a pain. Then I discovered Neutrik. If it's possible to fall in love with a cable connector, I did. The NC series are brilliant. No set screws. Easy assembly. And if you get the solderless ones, you don't even need to solder. Wow, I liked those! In the last 10 years, I bet I've used 500 or more Neurik XLR connectors. The one thing about Neutrik XLRs is that they are still made up of 4 parts; the shell, the connector, the strain relief and the cover. A few months ago, I accidentally discovered a connector that has stolen my heart. I was rummaging through a box of stuff and found Switchraft's new AAA series connectors. It's a metal body with an integral strain relief. The plug is already assembled in the shell, so it comes apart into 2 pieces. Slip the shell over the wire, solder to the plug (or jack) and screw it together. This is so simple! Over the course of soldering up a 32 input snake, I know I saved a bunch of time. 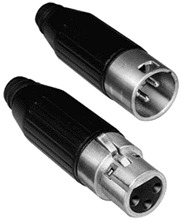 The connectors are really easy to use, and have nice, solid solder cups. Another difference between the Switchcrafts and the Neutriks is the depth of the solder cup, and the thickness of the cup itself. Neutriks have deep cups, which take a lot of solder to fill properly. They are made of fairly thin metal, too. I've never had one fail, but Switchcraft has a nice, thick cup that isn't too deep. So you can achieve proper fill with less solder, which means less time. If you're doing one or two ends on a mic cable, it's no big deal. But if you are making up a snake, saving 30 seconds on a connection adds up. They are a twist-lock design and don't come unplugged like the old 1/4" monitor cables. Whoever thought that the 1/4" plug was a good speaker connection, anyway? These connections are rock solid and reliable. They even come in multiple pin connections (2, 4 and 8 for normal, bi-amped and, well, I guess quad-amped). So there you go. An inside look into the mind a true geek. An entire blog post about cable connectors. Seems trivial, but connectors are essential to what we do. Think about how many signals pass through how many connectors for a typical service. A quick mental count for one of our normal services and I'm into the hundreds of connectors. Do connectors seem insignificant? You bet. But consider the havoc when one fails! Peace.